Ms Hudson said the not-for-profit club had been a part of the Toowoomba community for almost 30 years but was at risk of closing due to loss of membership dollars. The club lost a large number of children to a private swim club recently and is currently one month behind in paying their $1,500 monthly pool lease fees. “Our club is very family-friendly, welcoming, and we’re not flash but everybody feels a part of it,” Ms Hudson said. 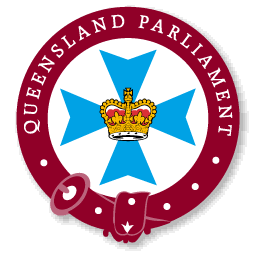 Member for Toowoomba South David Janetzki MP urged the business community to support the swim club. “Flyers is Toowoomba’s only community-operated swim club, run by Mums and Dads who just want to see their children enjoy swimming either recreationally or competitively,” Mr Janetzki said. “There are also a number of children in the club who swim to help with their medical conditions such as juvenile arthritis and brittle bone disease – it would be devastating if this club is forced to close,” he said. The club offers recreational swimming, competitive swim training, and learn to swim classes. After losing a large number of members, which coincided with the slow winter season, the club has struggled to cover their bills which include $1,500/month pool leasing fees and coaching fees. Ms Hudson said their upcoming swim meet would help relieve some of their financial problems but they were working hard to make ends meet. Nominations for this year’s swim meet were down due to the recent Milne Bay Pool closure. “We’re out scouting businesses for sponsorships,” Ms Hudson said. “We’re pretty determined and we’re not prepared to go under,” she said. 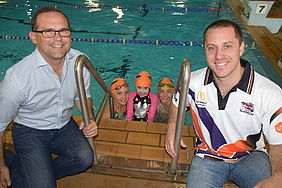 Image Caption: David Janetzki MP, Toowoomba Flyers Swimming Club president Robert Michel, swim club members Elizabeth Koch, Evie Michel and Wyatt Michel.